The ripe fruits of Chaenomeles speciosa (Sweet) Nakai. of family Rosaceae. Anhui, Sichuan and Hubei provinces, etc. Collected in summer and autumn when the fruit is greenish yellow. Slightly fragrant smell and sour taste. Big fruit with wrinkled peels, purplish red in color, solid nature and sour in taste. Sour, warm; liver and spleen meridians entered. Dispel wind-damp, sooth tendons and activate collaterals, resolve dampness for harmonizing stomach. It can dispel wind-damp and sooth tendons and vessels. It specializes in removing dampness and is rated as the essential herb for treating dampness arthralgia characterized by spasm of tendons and vessels. For arthralgia syndrome due to cold and dampness, it is often combined with wind-damp-dispelling, and meridians-warming and cold-dispelling herbs, such as Du Huo, Cang Zhu and Chuan Wu, etc, For arthralgia syndrome due to dampness and heat, it is often combined with wind-damp-dispelling and heat-clearing herbs, for example, Qin jiao, Fang Ji and Ren Dong Teng, etc. Being sour and liver meridian entered, it excels in soothing tendons and activating collaterals, so it is also commonly indicated for aching pain with heavy sensation of waist, knees and joints, and should be combined with liver-kidney-tonic herbs, such as Ba Ji Tian, Gui Xin (Rou Gui) and Niu Xi, as in Mu Gua Wan from Yu Yao Yuan Fang (Prescription from Emperor Medical Institute). For spasm of tendons, stiffness of neck with difficulty in moving around, it should he combined with blood-activating and collaterals-unblocking herbs, Ru Xiang and Mo Yao are the examples. With warm nature, it can remove dampness and relax tendons. It is the commonly used herb for treating downward flow of damp turbidity to the foot and edema, and can be combined with dampness-drying, qi-moving, and diuresis-inducing herbs. For example, Wu Zhu Yu, Zi Su Ye and Bing Lang, as in Ji Ming San from Zhu Shi Ji Yan Fang (Collection of Experiential Prescription from Dr. Zhu). With warm and fragrant natures, and spleen meridian entered, it can resolve dampness and harmonize stomach to transport the middle energizer and check diarrhea; with sour flavor and liver meridian entered, it can sooth tendons to relieve spasm. 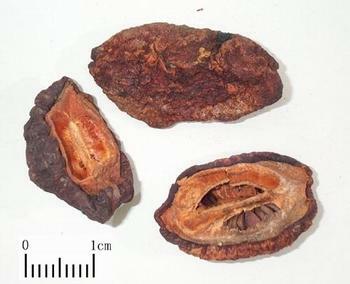 It is often indicated for obstruction of turbid dampness in middle energizer which is manifested by abdominal pain, vomiting, diarrhea and spasm of muscle: if the cold is predominant, it is often combined with dampness-drying, and cold-dispelling herbs, such as Wu Zhu Yu and Xiao Hui Xiang, as in Mu Gua Tang from San Yin Fang (Treaties on the Three Categories of Pathogenic Factors and Prescriptions); and if the heat is predominant, it is often combined with heat-clearing and damp-removing herbs, for example, Can Sha, Huang Lian and Yi Yi Ren, as in Can Shi Tang from Huo Luan Lun. (Treatise on Cholera). In addition, it has the the action of promoting digestion and is indicated for dyspepsia.